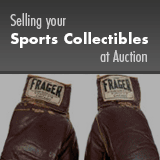 Why Consign with Heritage Auctions? Our patented, online auction platform, Heritage Live, maximizes bidding activity, allowing bidders to place bids on your items during the live auction event from anywhere in the world. Heritage has been in business since 1976, grown by the same leadership that directs the company today. Heritage is staffed by seasoned professionals that know the industry and how to get the most for your consignment. Meet our Consignment Director team. From the minute your collection arrives in our Dallas world headquarters, Heritage's staff of professionals start evaluating your collectible, and developing strategies that will maximize the prices realized at auction.